During the summer months, the temperature in Indiana can reach dangerous levels. 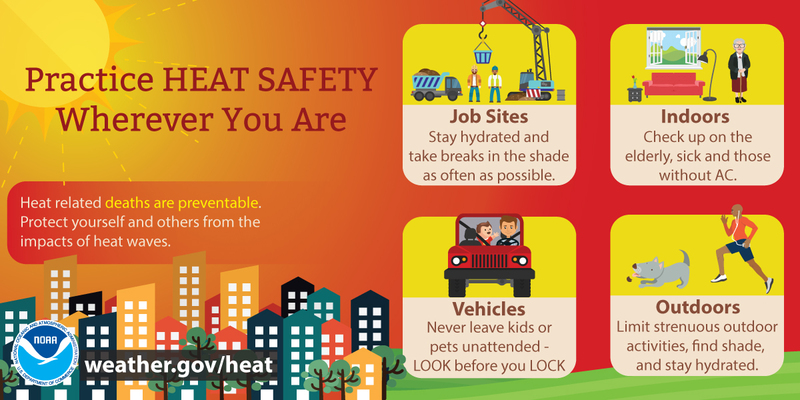 Extreme heat can be particularly hazardous for children, seniors, those with special needs, and pets. In addition to discomfort and fatigue, high temperatures can cause heat-related illnesses: heat cramps, heat exhaustion, and heat stroke. To protect yourself and others, please familiarize yourself with the following guidelines. Heat Wave - A period of abnormally and uncomfortably hot and unusually humid weather. Typically a heat wave lasts two or more days. Excessive Heat Watch - Issued by the National Weather Service when heat indices in excess of 105ºF (41ºC) during the day combined with nighttime low temperatures of 80ºF (27ºC) or higher are forecast to occur for two consecutive days. Heat Advisory - Issued within 12 hours of the onset of the following conditions: heat index of at least 105°F but less than 115°F for less than 3 hours per day, or nighttime lows above 80°F for 2 consecutive days. Excessive Heat Warning - Issued within 12 hours of the onset of the following criteria: heat index of at least 105°F for more than 3 hours per day for 2 consecutive days, or heat index more than 115°F for any period of time. Heat Index - The Heat Index (HI) or the "Apparent Temperature" is an accurate measure of how hot it really feels when the Relative Humidity (RH) is added to the actual air temperature. Stay out of the sun. If you must be in the sun, wear sunscreen (at least SPF 15) and a side-brimmed hat. Stay in the shade or under awnings as much as possible. Avoid overexertion and strenuous outdoor activities. Consume plenty of non-alcoholic, non-caffeinated fluids, even if you don't feel thirsty. Water, diluted juices, and electrolyte solutions are best. Stay away from carbonated drinks. If you are on a fluid-restricted diet or taking diuretics, consult your doctor before exposing yourself to heat. Keep lights in your home low or off, keep shades drawn, and avoid using the oven. Keep rooms well ventilated with air conditioners and fans. Keep your windows open if you don't have air conditioning or a fan. Note: Fans will not prevent heat-related illness when the temperature is in the high 90s. Cool down with cool, wet towels and periodic cool baths or showers. Take advantage of cooling centers, public pools, and air-conditioned stores and malls during periods of extreme heat. Exposure to air conditioning for even a few hours a day will reduce the risk for heat-related illness. Closely monitor children, the elderly, or those who require special care during periods of intense summer heat. Do not leave children or pets in a closed vehicle, even for a few minutes. On a hot day, temperatures inside a closed vehicle can reach 140ºF-190ºF within 30 minutes. Make a special effort to check on your neighbors during a heat wave, especially if they are seniors, families with young children, people with special needs, or living alone. Seniors and others who may be sensitive to extreme heat should contact friends, neighbors, or relatives periodically throughout the day. Seek help if you feel symptoms of heat-related illnesses.